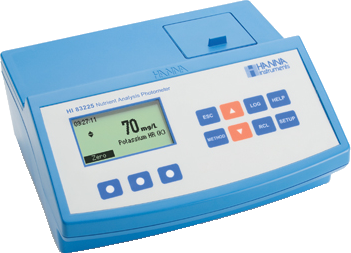 HI 83225-02 is a compact , portable/lab photometer. Specially designed to quickly and efficiently determine used in agriculture and horticulture. Nutrients With the HI 83225-02 , 7, one can determine parameters such as nitrogen, phosphate , potassium (potash) , calcium, magnesium and sulphate. Control and monitoring of your dose of nutrients for the HI 83225-02 no problem. Nitrogen, phosphorus, and potassium (NPK) are often the first three factors considered when making recommendations to growers. Compared to the HI 83215, the HI 83225 provides control over three additional important growing factors: sulfur (most common as sulfates), calcium and magnesium. HI 83225 is designed for the hydroponics and greenhouse industries to measure seven nutrients commonly present in fertilizer enriched solutions. 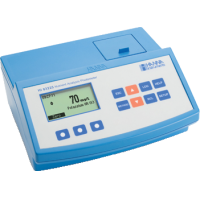 It can measure fifteen different methods using specific liquid or powder reagents, and has four measuring channels for a wide range of tests. The optical system of HI 83225 is based on special subminiature tungsten lamps and narrow-band interference filters to guarantee both high performance and reliable results. HI 83225 has a powerful interactive user support that assists the user during the analysis process. A full tutorial is available in the Setup Menu, and the Help Menu provides assistance for every step in the measurement process. This meter can be connected to a PC via a USB cable, where the data can be managed with optional HI 92000 Windows® compatible software. Includes all standard tests for ammonia , nitrate , phosphate , potassium (potash) , calcium, magnesium and sulfate.